“Otherwordly” is one of the first words that comes to mind when describing the music on compilation album “Incantations from the Abyss”. (The compilation consists of the demos “Consecration of the Temple” and “Rehearsal 09/15”.) A question which floated around my head as I listened to the album was why I find the music to be otherworldly. Perhaps the answer is that I don’t listen to cavernous death metal often, so maybe it’s a novelty factor. There are two versions of “Consecration of the Temple”; one is the original recording, and the other is a rehearsal version from 2015. The first version is more complex, with more instruments playing a part. The original opens with piano notes that reminded me of the jerky movements of a spider. The horns and bells further added to a feeling of impending chaos. The gongs that announce the full band have a ghostly feel, as if they’re coming from far away. While there’s a generous helping of reverb applied to the music, I think it works here, and that the lack of conventional songwriting works as well. The guttural vocals are spine-tingling, which is a good thing in this case, as it helps to sell the occultism themes. Riffs swirl like wraiths’ hands grabbing for the living. 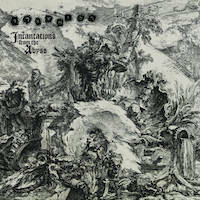 The same unsettling bells and horns from the first track lead into “Morte Datores”. A rainstorm of notes comes pouring down on the listener in the form of distortion-drenched, speedy riffs, and then slows down for a brief respite. The riffs may be heavy enough to collapse the walls of Hell itself. There are some interesting drum fills scattered around, and things end on a spooky note with keyboard melodies that made me think of some vast underground hall far from the eyes and ears of potential saviours. It was an interesting exercise to listen to DEMONCY’s version of “Winter Bliss” before hearing QRIXKUOR’s version. The original is perhaps more distinctly black metal, with a production that just manages to stay on the listenable side. The cover, like the other tracks on this album, floats somewhere between death metal and black metal. The vocals are eerie, and the bass guitar thunders like a storm passing through. Maybe I haven’t heard enough “cavernous death metal” to become weary of bands with a similar sound to QRIXKUOR. But I think that the most important aspect here is that this compilation gave me a means to be somewhere else temporarily – being immersed in music to such an extent that I forget about the mundanities of life is always an enjoyable experience.